Rheumatic heart disease (RHD) is the major long-term sequel of acute rheumatic fever (ARF), which involves the cardiac valves leading to stenosis or regurgitation with resultant hemodynamic disturbance. The incidence of ARF and prevalence RHD in the sub- Saharan Africa including Ethiopia are amongst the highest in the world. The main priority of long-term management of ARF or RHD is to ensure that patients are adherent to the secondary prophylaxis which is monthly benzathine penicillin injection to prevent recurrent attacks of ARF. A cross-sectional study was conducted among sampled 241 RHD patients having at least one year follow-up at cardiac clinic of Jimma Medical Center (JMC) who appointed every month to receive injections of antibiotic prophylaxis. The data was collected for 4 months (from June 1-September 30, 2018) by asking their follow-up status of last one year retrospectively and assessing related variables by using face to face interview. After the data was collected using structured questionnaires, it was coded, entered into Epi data and exported to SPSS for further analysis. The adherence rate of RHD patients was determined by frequency of annual injections of prophylaxis. A total of 241 patients with RHD were interviewed, among those 224 (93.0%) were received the secondary prophylaxis at least once within last one year, despite frequency differs while 17 (7.0%) of them didn’t initiate the prophylaxis yet. The adherence rate of the assessed RHD patients to secondary prophylaxis was 55.2% while the left 108 RHD patients (44.8%) were generalized as non-adhered to the prophylaxis [can be who either don’t start the prophylaxis 17 (7.0%) or who missed the prophylaxis more than three times annually 86 (35.6%)]. The main reasons for poor adherence were lack of money 41 (38%), far distance from hospital 28 (26%), fear of medication side effects and painful injection 25 (23%), and lack of knowledge about the disease and prevention 14 (13%). RHD patients attending cardiac clinic of JMC had low adherence rate (55.2%) to the secondary prophylaxis due to lack of money, far distance from the setup, painful injection especially among children and lack of awareness about the disease. Acute rheumatic fever (ARF) and rheumatic heart disease (RHD) represent the first cause of cardiac mortality among children and young people in developing countries(1). The worldwide prevalence of RHD is estimated to 15.6 million people, with an annual incidence of ARF of 470,000. The burden of mortality still concerns 230,000 people per annum, caused by infective endocarditis and heart failures(2,3). The prevalence of heart diseases in children and young adults, including congenital heart disease and RHD are highest but underestimated due to many reasons(4). The prevalence of RHD was also highest in Ethiopia as revealed by many studies that conducted in different parts of the country among school children and other groups which needs due emphasis on management protocols(5-10). Since 1980s, the recommendations of World Health Organization is to promote secondary prevention as the cornerstone of control programs by continuous administration of specific antibiotics to patients with a previous attack of rheumatic fever, or well-documented RHD(11). Secondary prevention of rheumatic fever has multipurpose, applicable and cost effective strategy to prevent colonization or infection of the upper respiratory tract with group A β-hemolytic streptococcal pharyngotonsillitis and the development of recurrent attacks of rheumatic fever, to reduce mortality and morbidity due to disease(12-16). The recommended secondary prophylaxis is intramuscular injections of benzathine benzyl penicillin G (BPG), every three to four weeks which is determined by a number of factors, including age, time since the last episode of ARF, ongoing risk of streptococcal infections and potential harm from recurrent ARF and its dosage being adapted to patient’s weight(12,17). The implementation of monthly administration of secondary prophylaxis to all RHD patients should need due emphasis and its effectiveness in reducing rates of streptococcal pharyngitis, recurrences of ARF and the progression of RHD should clearly evaluated periodically; otherwise it might even lead to mild to moderate valvular lesions within a decade(18-20). Thus simultaneously promoting adherence of patients to secondary prophylaxis should be addressed and assessed timely as the management modality(21). Patient adherence is defined as the concordance between the patient’s behavior and the care provider’s recommendations(18,22). Global adherence to treatment of chronic diseases in developed countries averages only 50%, particularly affecting the poor population(23). As many factors interact and interfere with adherence, it is considered as a multidimensional phenomenon(24). Even though the level of adherence required to prevent further episodes of ARF is not known, the objective is to reach 100% of the annual expected BPG injections, with a recommended benchmark of 80%(25). Patients receiving less than 80% of prescribed doses are considered as none adhered with high risk of recurrence of ARF(15,25). The objective of the present study was to evaluate rates of adherence of RHD patients attending cardiac clinic of Jimma Medical Center (JMC) to BPG injection prophylaxis and to assess the reasons for poor adherence. The cross sectional study was conducted among RHD patients attending Cardiac Clinic of JMC for at least one year who appointed every month to receive secondary prophylaxis. JMC is located in Jimma zone, Southwest Ethiopia which is the largest and pioneer referral specialized teaching hospital of the country, serving millions of patients dwelling in the catchment area. The study was conducted for 4 months (from June 1- September 30, 2018 among RHD patients). Information of pediatrics was received from their corresponding parents or caregivers. Standardized and structured questionnaire was used for data collection. The collected data was cleaned, coded, entered in to Epi data version 3.1 and finally exported to SPSS version 22 for further analysis. Adherence of RHD patients was determined based on frequency of annual prophylaxis they received and considered as adhered, not adhered and not started the prophylaxis yet. For pediatric RHD patients, their family’s adherence (bringing child to the institution for receiving prophylaxis was evaluated). Approval of the proposal was obtained from Institutional Review Board of Jimma University, Institute of Health (IRB/989/2018). An informed written consent was obtained from patients or/and parents of pediatric patients less than 16 years after explaining the purpose of the study. The respondents were also informed that the obtained information would not be disclosed to a third party. Good adherence or adhered to prophylaxis: if the rate of adherence was covering ≥80% of prophylaxis (patient was not missed any injection or only missed three or less than three times injection in the last 1 year or received prophylaxis nine or more than nine times). Poor adherence or not adhered to prophylaxis: if the rate of adherence is <80% (patient had missed their regular injection more three times in the last 1year). During the period of June 1-September 30, 2018, a sample of 241 RHD patients who came to Cardiac Clinic of JMC for follow-up were interviewed, of these 135 (56%) were pediatric age group (age 5-16 years) and 106 (44%) were adult age group as the overall age ranges from 5-68 years. The male to female ratio was 1:1.2 computed from 135 (56.0%) females and 106 (44.0%) males. Majority of the patients were dwelling in rural part 172 (71.4%) while urban dwellers account 69 (28.6%). Majority of RHD patients were illiterate [90 (37.3%)] while 36 (14.9%) and 62 (25.7%) attended grade 5-8 and grade 9-12 respectively. 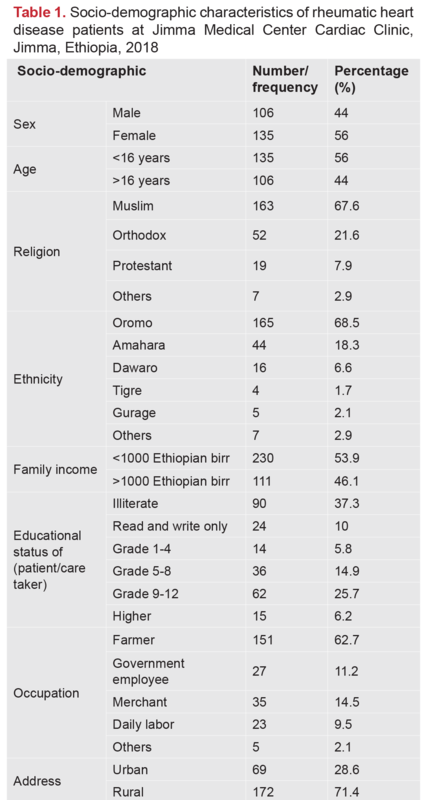 Majority of the patients or their care givers were farmers 151 (62.7%) who were considered as low income with monthly income below 1000 Ethiopian birr (53.9%). Majority of the patients [195 (80.9%)] were living at the distance of more than 3 kilometers away from JMC where they seek service. The detail is well seen in Table 1. Out of a total of 241 patients, majority of them 224 (93.0%) took secondary prophylaxis (intra muscular injection of BPG) during follow-up of last one year despite frequency varies. From a total of 224 RHD patients who took secondary prophylaxis, 86 (35.6%) of them missed their regular injection for more than three times and 5 (2.1%) never missed any annual prophylaxis (100% coverage) last year who have to be appreciated. In general the adherence rate of RHD patients to secondary prophylaxis was 133 (55.2%) who received more than nine annual prophylaxis or missing less than three months while the left 108 (44.8%) considered non adhered [can be either who don’t start prophylaxis yet (7.0%) or who missed more than three times of last year prophylaxis (35.6%)] as detailed in Table 2. The main reasons to miss and don’t initiate their prophylaxis among the 108 RHD patients with poor adherence were lack of money 41 (38%), followed by far distance from hospital 28 (26%), fear of medication side effects and painful injection 25 (23%), and lack of knowledge about the disease and prevention 14 (13%). Among the total 241 RHD patients assessed, majority of them (56%) were pediatric age group (age 5-16 years) and female (56%) dwelling in rural part (71.4%) which is also in line with global epidemiology of the disease being highest among school children, females and rural part(3,5). The level of adherence of RHD patients to secondary prophylaxis was 55.2% as computed from the annual frequency of intramuscular injection (more than 9 times per last year is considered as adhered) which was very low and needs due emphasis. This low adherence rate is also in harmony with the study of Musoke et al. who reported the adherence rate of 54%, also in nearly similar range with the finding of systematic analysis done by Kevat et al. and Amarilyo et al.(26-28). But the present finding was against the studies of de Dassel et al. with their finding of high adherence rate of 63.5-67.5% probably due to study design difference as they approach by register data analysis, the finding of Nicola Culliford-Semmens et al. who revealed maximum adherence rate of RHD patients to secondary prophylaxis (92%) due to the socio-demographic difference of our patients and New Zealand and design difference(29,30). Opposing the finding of the present study, highest adherence of RHD patients to secondary prophylaxis was also reported by studies of Sial et al. (73.5%), Saxena et al. (93.6%) may be due to study design and socio-demographic difference(31,32). The finding of present study was also inconsistent with the study of Gasse et al. and Pelajo et al. who reported even lower adherence rate (46%) and (32-42%)(33,34). The probable justification for this difference is a significant variation in study design and socio-demographic characteristics. The main reasons/barriers affecting low adherence rate of RHD patients to secondary prophylaxis was lack of money, far distance to the setting, painful injection and lack of awareness about the disease. This objective was also in line with the study of Petricca et al. who conducted at the setting to explore those barriers (disease perception, quality of service and cost)(35). The present finding for reasons of low adherence was also supported with study of Musoke et al. that conducted in Uganda and Nemani who explored the absence of proper counseling followed by a sense of well-being, injection site pain and financial constraints as the main reasons for low adherence(26,36). I would like to thank Jimma University and Community Based Education Office for providing this golden opportunity and stationery provision. I would also like to thank JMC for permission of data collection. At last but not least, my honored thanks go to data collectors (cardiac clinic staff nurses) and RHD patients and pediatric correspondents for their invaluable cooperation for the success of the study. Ethics Committee Approval: Institutional Review Board (IRB/989/2018 of Jimma University, Institute of Health). Informed Consent: An informed written consent was obtained from patients or/and parents of pediatric patients less than 16 years after explaining the purpose of the study. The respondents were also informed that the obtained information would not be disclosed to a third party. Surgical and Medical Practices: K.M., W.R.D., M.B.G., Concept: K.M., W.R.D., M.B.G., Design: K.M., W.R.D., Data Collection or Processing: K.M., Analysis or Interpretation: K.M., W.R.D., Literature Search: K.M., W.R.D., Writing: K.M., W.R.D. Marijon E, Mirabel M, Celermajer DS, Jouven X. Rheumatic heart disease. Lancet 2012;379:953-964. Seckeler MD, Hoke TR. The worldwide epidemiology of acute rheumatic fever and rheumatic heart disease. Clin Epidemiol 2011 Feb 22;3:67-84. Zühlke L, Mirabel M, Marijon E. Congenital heart disease and rheumatic heart disease in Africa: recent advances and current priorities. Heart 2013;99:1554-61. Gemechu T, Mahmoud H, Parry EH, Phillips DI, Yacoub MH. Community-based prevalence study of rheumatic heart disease in rural Ethiopia. Eur J Prev Cardiol 2017;24:717-723. Günther G, Asmera J, Parry E. Death from rheumatic heart disease in rural Ethiopia. Lancet 2006;367:391. Befekadu H, Shehab A, Mocumbi AO, Aguib Y, Yacoub MH. Genetic susceptibility to rheumatic heart disease in three African populations: Egypt, Ethiopia and Mozambique. Curr Trend Cardiol 2017;1. Mulatu HA, Woldemichael M, Aberra M. Prevalence of Rheumatic Heart Disease among Primary School Students in Mid-Eastern Ethiopia. Biol Syst Open Access 2015 Dec 26;5:1-4. Yadeta D, Hailu A, Haileamlak A, et al. Prevalence of rheumatic heart disease among school children in Ethiopia: A multisite echocardiography-based screening. Int J Cardiol 2016;221:260-3. World health organization. WHO programme for the prevention of rheumatic fever/rheumatic heart disease in 16 developing countries: report from Phase I (1986-90). WHO Cardiovascular Diseases Unit and principal investigators. Bull World Health Organ 1992;70:213-18. Manyemba J, Mayosi BM. Intramuscular penicillin is more effective than oral penicillin in secondary prevention of rheumatic fever--a systematic review. S Afr Med J 2003;93:212-8. RHD Australia (ARF/RHD writing group) National Heart Foundation of Australia and the Cardiac Society of Australia and New Zealand: The Australian guideline for prevention, diagnosis and management of acute rheumatic fever and rheumatic heart disease. 2nd edition. RHD Australia: Menzies School of Health Research; 2012. Steer AC, Colquhoun S, Kado J, Carapetis JR. Secondary prophylaxis is important for the prevention of recurrent rheumatic fever in the Pacific. Pediatr Cardiol 2011;32:864-5. Manyemba J, Mayosi BM. Penicillin for secondary prevention of rheumatic fever. Cochrane Database Syst Rev 2002, CD002227. Haynes RB, Ackloo E, Sahota N, McDonald HP, Yao X. Interventions for enhancing medication adherence. Cochrane Database Syst Rev 2008, CD000011. Steer AC, Carapetis JR. Prevention and treatment of rheumatic heart disease in the developing world. Nat Rev Cardiol 2009;6:689-98. Alex B, Warren W. Diagnosis and management of acute rheumatic fever and rheumatic heart disease in Australia, National heart foundation of Australia; 2012;590:1-100. Engelman D, Mataika RL, Kado JH, et al. 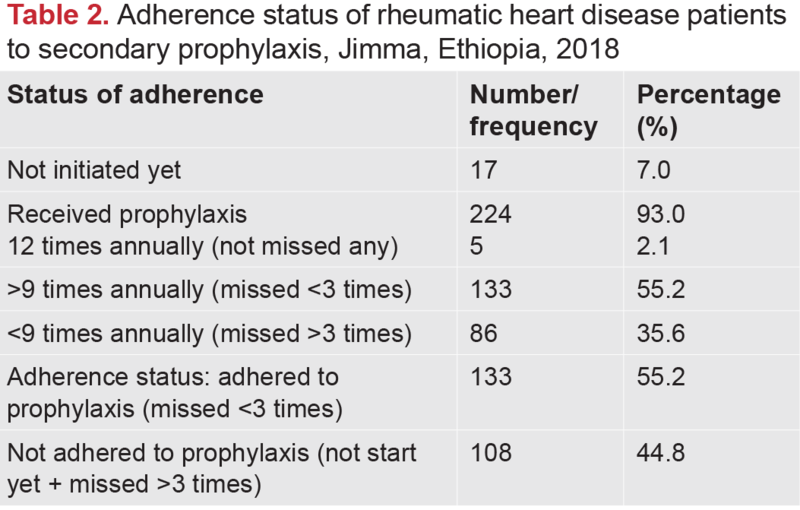 Adherence to secondary antibiotic prophylaxis for patients with rheumatic heart disease diagnosed through screening in Fiji. Trop Med Int Health 2016;21:1583-91. Osterberg L, Blaschke T: Adherence to medication. N Engl J Med 2005;353:487-97. Global adherence to treatment of chronic diseases in developed countries averages only 50%, particularly affecting the poor population. World Heart Federation: Diagnosis and Management of Acute Rheumatic Fever Rheumatic Heart Disease. Geneva: World Heart Federation before; 2007. Musoke C, Mondo CK, Okello E, et al. Benzathine penicillin adherence for secondary prophylaxis among patients affected with rheumatic heart disease attending Mulago Hospital. Cardiovasc J Afr 2013;24:124-9. Amarilyo G, Chodick G, Zalcman J, et al. Poor long-term adherence to secondary penicillin prophylaxis in children with history of rheumatic fever. Semin Arthritis Rheum 2018 Oct 16. Dassel JL de, Fittock MT, Wilks SC, Poole JE, Carapetis JR, Ralph AP. Adherence to secondary prophylaxis for rheumatic heart disease is underestimated by register data. PLoS One 2017, e0178264. Culliford-Semmens N, Tilton E, Webb R, et al. Adequate adherence to benzathine penicillin secondary prophylaxis following the diagnosis of rheumatic heart disease by echocardiographic screening. N Z Med J 2017;130:50-57. Sial JA, Farman MT, Batra MK, Karim M. Adherence to secondary prophylaxis of rheumatic fever in patients with rheumatic heart disease in rural areas. Pak Heart J 2018;51:243-47. Saxena A, Mehta A, Ramakrishnan S. Adherence to Benzathine Penicillin in Children with Rheumatic Fever/Rheumatic Heart Disease: Results from an Indian Pediatric Rhd Registry. J Am Coll Cardiol 2015;65. Gasse B, Baroux N, Rouchon B, Meunier JM, Frémicourt ID, D’Ortenzio E. Determinants of poor adherence to secondary antibiotic prophylaxis for rheumatic fever recurrence on Lifou, New Caledonia: a retrospective cohort study. BMC Public Health 2013;13:131. Pelajo CF, Lopez-Benitez JM, Torres JM, de Oliveira SK. Adherence to secondary prophylaxis and disease recurrence in 536 Brazilian children with rheumatic fever. Pediatr Rheumatol Online J 2010;8:22. Petricca K, Mamo Y, Haileamlak A, Seid E, Parry E. Barriers To effective follow-up treatment for rheumatic heart disease in Jimma, Ethiopia: A grounded theory analysis of the patient experience. Ethiop J Health Sci 2009;19:39-44. Nemani L, Maddury J, Barik R, Arigondam AK. A Cross-sectional study to look at the determinants of poor adherence to secondary penicillin prophylaxis for rheumatic heart disease at a tertiary care center in South India. J Clinical and Preventive Cardiology 2018;7:5-10.